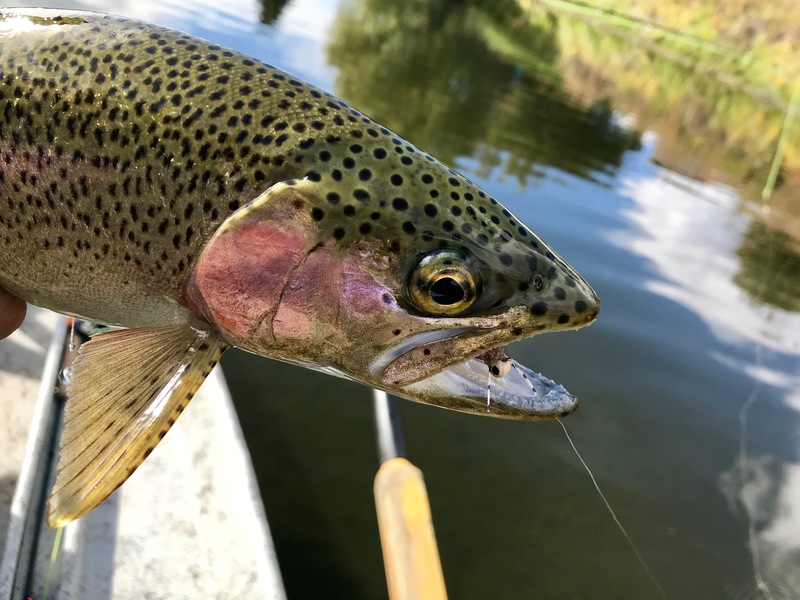 October has been keeping us busy on the river and away from the computer but our long overdue Bozeman fly fishing report is here. This year we have seen the most consistent fly fishing all across southwest Montana we have probably ever seen and October so far has brought more of the same. Our Bozeman fly fishing guides have been on the water with anglers daily on the Missouri River, Madison River, Yellowstone River, and DePuy’s Spring Creek. And have seen nothing short of great fishing every day. Dry fly fishing, nymphing, and streamer fishing have all been in play, and we’ve been seeing lots of great trout coming to the net.Weather has been more what you would expect in November, but snowy, rainy, overcast days have meant for blanket hatches of BWOs on a daily basis. Lots of fish looking up and plenty of hot coffee on board our boats to keep us going through it all. The main attraction for our anglers in October. Lots of targets on the surface right now feeding on a variety of bugs. BWOs, midges, small tan caddis, callibaetis, and October caddis are all in play. Had a few eat a hopper too. Snowy days have brought the most fish to the surface. Sunny days they can be a little fussier. Nymphing has been great on the upper river from the Dam to Craig. Zebra midges continue to be our top producer. Head down river for fall fly fishing solitude. Bugs hatching in big numbers all the way down to Cascade.The Upper Missouri River near Toston, MT has come back in shape and hatches of BWOs have the big lakers looking up. Never a numbers game in here but a great option if you are looking to fish off the beaten path. Our October freestone favorite. And you’ll likely have the whole place to yourself. Solid hatches of BWOs keep the fish at or near the surface. Streamer fishing has been solid for larger than your average trout. Our Bozeman fly fishing guides generally fish close to town in the fall since traffic is light, but anglers can expect good fishing all along the length of the Yellowstone River. Nymphing will keep rods bent all day long. Dry-dropper fishing is our first choice with large parachute style mayflies and smaller BWO droppers. A few bugling elk out there too. Good to great fly fishing on the Madison River daily right now. Good hatches and low pressure make for fun days. BWOs are the first choice has dry flies and dropper nymphs. Large attractors nymphs including princes, worms, and stones, are the best options for your first fly. The float stretch has been quiet. Busier as you move up towards West Yellowstone and into Yellowstone National Park. October is one of our favorite times of year to get out of the boat and do some wade fishing. Find one and there are usually a few more. “Bad”weather means great fly fishing on the Paradise Valley Spring Creeks. Anglerswill be greeted by great hatches of midges and BWOs and lots of rising fish.Slower when the sun is out. Nymphing has been great regardless. Cold feet? Headto the warming huts in between fish. Some of the best fall dry fly fishingaround. Good everywhere. Busier the further west you go. Head to the Barnes Holes on theMadison River to swing for fall run browns if you don’t mind fishing around the crowds. Head east for open water. Expect hatches of BWOs and some grey drakes to keep the fish looking up. If dry fly fishing is what you are after, there is no rush to the water, expect things to get going mid-day. Remember the weather changes quickly in the Park in the fall. Be ready for anything!